What Is Farine and How Do I Use It? Farine is what remains after the juice has been removed from a cassava. By itself, it's not much to get excited about. It's dry and it borders on tasteless, but it has its uses. It has sustained generations of islanders during lean economic times. The cassava grows abundantly in most Caribbean areas; farine is filling, and it can be safely stored for long periods of time. An explanation of farine begins with the cassava. This is a root vegetable that's native to Brazil and used frequently in​ Caribbean cooking and Trinidadian cooking. It's a perennial plant that thrives in warm, tropical climates. It's also called yuca or manioc in some areas. It's starchy and has a bit of a nutty taste, and it's chewy in its raw state, although eating it raw is not recommended. The cassava plant can produce traces of cyanide, a deadly compound, but this is eradicated when the root vegetable is peeled and exposed to heat in cooking. Cassava is loaded with calories but has negligible fat content. It's rich in copper, zinc, magnesium, and iron, and it's also a fairly good source of B-complex vitamins. First, the cassava's skin is sliced away and its meat is grated as finely as possible. The grated pulp is then enclosed in a porous bag and squeezed hard to release and strain the juice and moisture. The remaining pulp is then gently parched in a heated flat pan until it turns a light brown color, ideally over an open flame. This can literally take hours. The finished product—farine—resembles coarse grains, something like a heartier version of Cream of Wheat. In some areas of the Caribbean, the pulp is placed in the sun to dry for a few hours before being further parched over heat. Overall, it's not a quick process, but when farine is stored in an airtight container in a cool, dark place, it will last almost forever. First, it should be noted that farine is an acquired taste—mostly because it doesn't have much taste. It can be mixed with milk and sugar to liven it up, creating a nutritious drink, but it's most often used as an ingredient in porridge and bread. 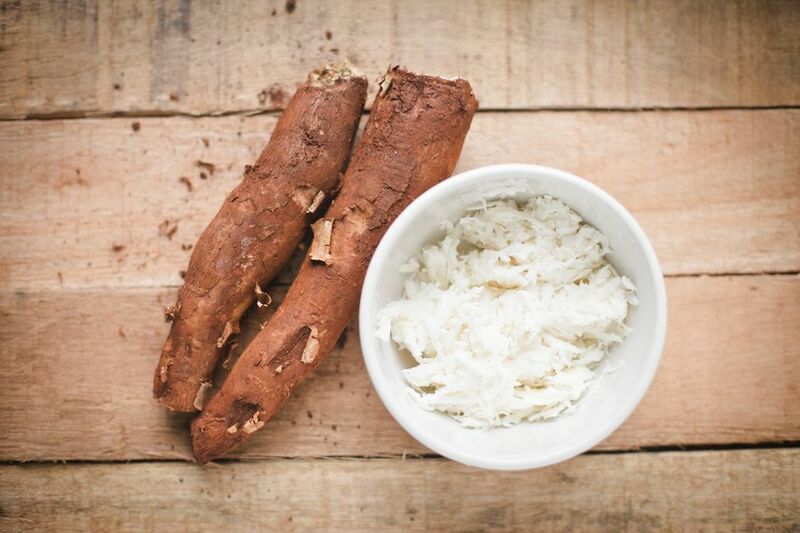 It's also added to soups and stews as a thickening agent, such as when making cassava cassareep. If you're living in the U.S., you most likely will not find an ample supply of farine-yielding cassava growing outside your door. You'll have to find a market that imports the root vegetable from the islands, and many do. The cassava will appear unnaturally shiny because it's waxed to help preserve it. It should be hard with no blemishes, soft spots or other signs of decay. You can store fresh, whole cassava in your refrigerator for up to seven days, or for as many as three days if you peel it and place it in cold water.